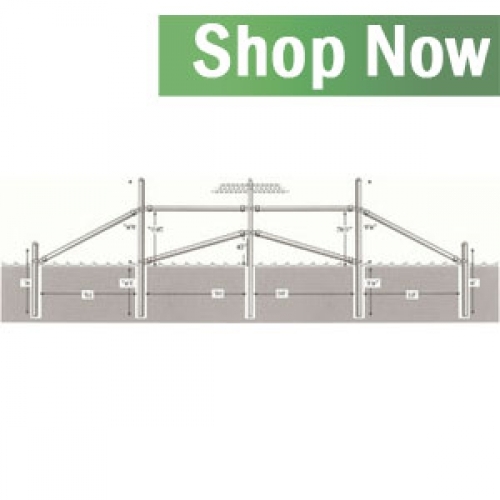 Fixed Knot Deer Fence, also known as Solid Lock Fence, is the strongest metal deer fence type on today's market for deer deterrence and livestock management. 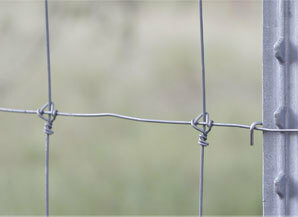 Similar to hog wire fence, the 12.5 gauge wire fence on Deerbusters.com is class 3 galvanized, which is the highest galvanization rating available, making this fence type extremely resistant to corrosion. We also have a 14 gauge woven wire fence that features an advanced zinc aluminum coating and is nearly 2-3 times as corrosion resistant as class 1 galvanized steel. Our high tensile fence has been proven to stop the most determined buck, and has an estimated life of 20-40 years in all weather elements. Who's using Woven Wire Fencing? Not only is Fixed Knot Fence recommended for high deer pressure, but livestock owners are also using this type of steel fence to contain cattle, sheep, goats, pigs and deer on farms and pastures. Farmers growing weeds and ornamental plants around pastures use woven wire fencing to separate livestock from certain plants declared as toxic to livestock animals including: milkweed, water hemlock, irises and buckeye.